My three year old loves pizza in almost any form, but I have to admit—there are days when I just don’t have the energy (or time) to make the dough. When that happens but I still want to serve up a yummy and quick meal, I love to make these sandwich bread pizza spirals. They pack all of the flavors that kids expect to find in pizza but in a super convenient form that comes together in just minutes. I love that these have pizza sauce inside, since the concentrated tomato packs a nice dose of vitamins in a kid-friendly form. There’s really no trick to this recipe other than making sure that the bread you use is soft, so you want sandwich bread rather than a bakery loaf with a hard crust. (As hard as I’ve tried, I have not found a gluten-free bread that works well in this. Let me know if you find one!) You can add in other toppings as well if your kids like them—pepperoni slices or some chopped olives would work—though these are really good left nice and simple. You can serve them as is, alongside a bowl of soup, or with a side of veggies. They are best served warm when the cheese is melty and the bread is freshly toasted, though my husband has been known to down the leftovers straight from the fridge—just like pizza. 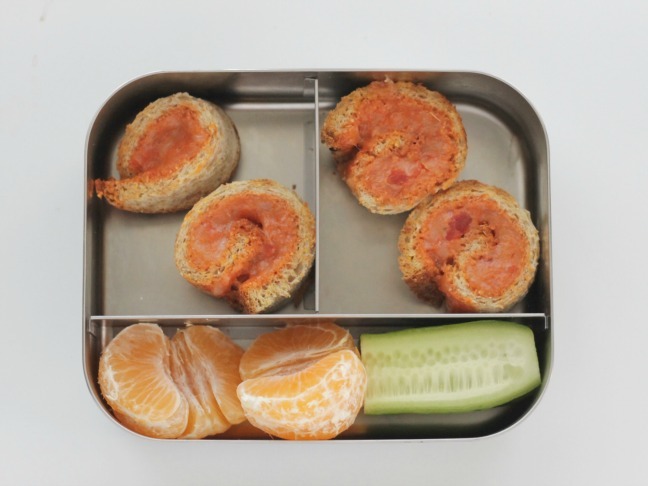 We sometimes make simple sandwich spirals for packed lunches, and these are just as easy. They make a nice lunch option since they require very little in the way of prep time, and they pack real flavor in such an easy-to-eat form. Pizza night just got a whole lot easier! Step 1: Preheat the broiler on low and get out a mini muffin tin. 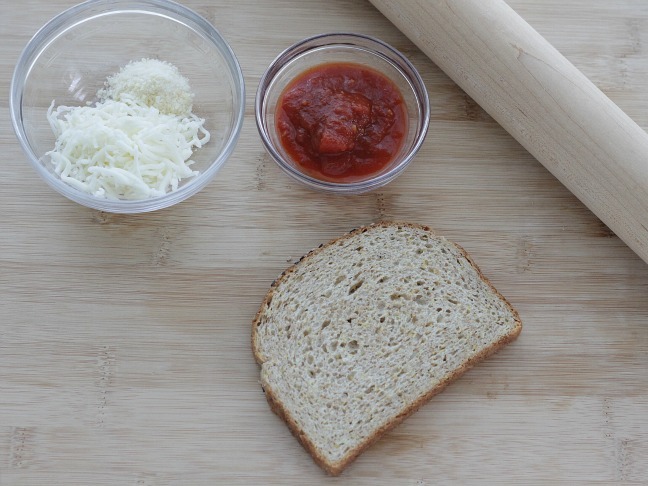 Step 2: Working with one slice at a time, place the bread onto a cutting board and flatten with a rolling pin. 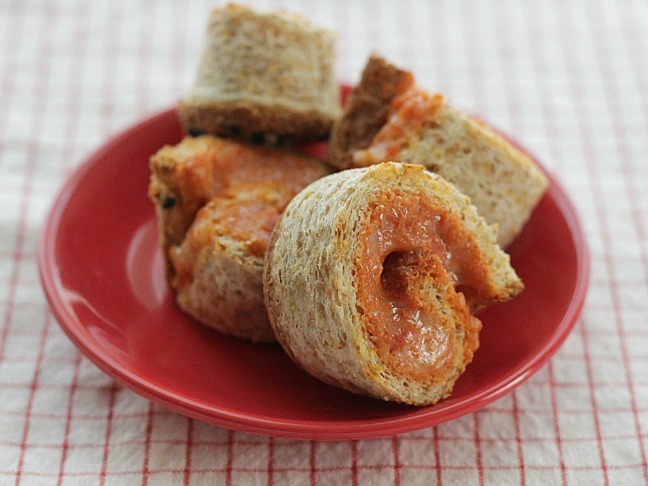 Step 3: Mix together the remaining ingredients and spread ¼ over the slice of bread. Step 4: Carefully roll up and slice into 4 rounds with a serrated knife. 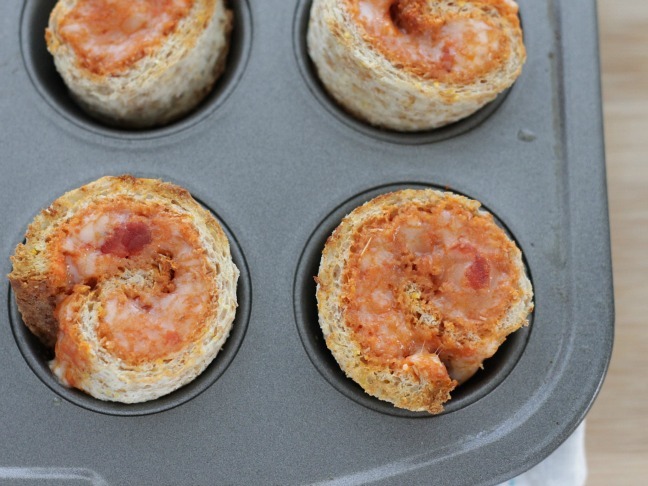 Step 5: Place each roll into a cup of the muffin tin. Repeat with the remaining slices of bread. Step 6: Place under the broiler for 3–5 minutes or until the cheese is just starting to melt and the bread is lightly toasted.